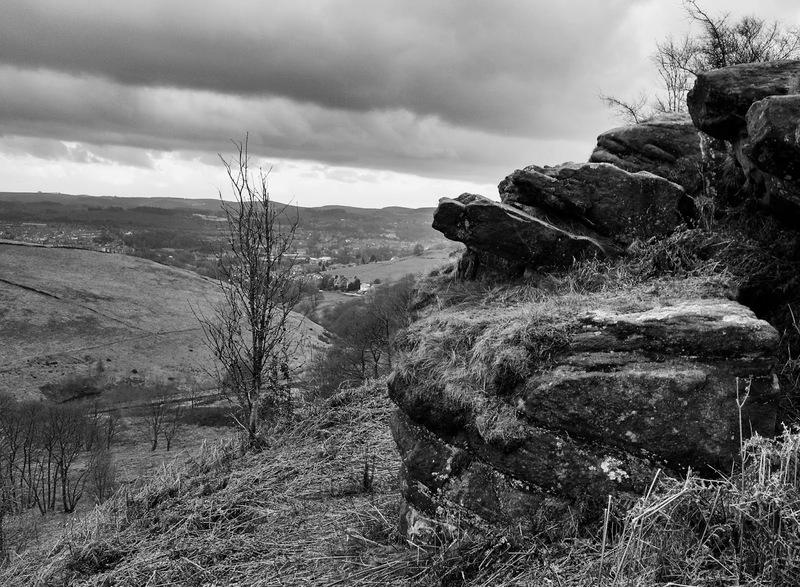 Jan and I walked the local hills near where we live in the Peak District the other day. We started from above Combs village and made our way onto Combs Moss. It was windy but dry and overcast. As we went on the top (to just over 500m) it was really windy, Jan was able to lean into it without falling over but it wouldn’t quite support my little bit of extra weight. Wind speeds of around 45mph are enough to support me so it was a bit less than this (I did the test a few years ago with a wind speed meter on the top of a mountain in Ireland!). It was blowing us sideways as we walked on the slippery tracks across the peat moor. I was actually checking out some locations for photos, one of which is a commission, but without carrying a camera. It was very flat lighting so not much chance for striking big views. I did take one on my phone and convert it to black and white to give an idea of what I will go back and take on a good day. It’s a bit calmer today so will be a bit easier as I walk over Eccles Pike behind the house.